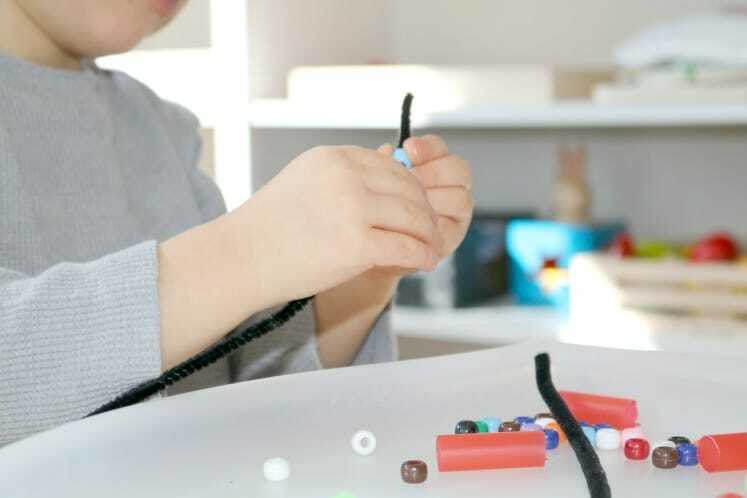 Today, we did the Snake invitation to create, which was a process art experience that focused on both fine motor (5.1) and visual arts (32.2) skills. It’s an assessment activity, which means there are assessment questions included and a work sample and/or photo should be saved for the student’s portfolio. Next year, we’ll get a little more in depth into creating a portfolio. This year, I’m all about just making notes for myself. You know, the little guy’s strengths and weaknesses and that kind of thing. After all, he’s not even technically a preschooler yet. We still have a few years, right? And you know what? With its emphasis on thematic learning, I’m really hoping to stick with Mother Goose Time indefinitely. I actually just got next month’s little yellow school bus box and saw the 2017-2018 list. I’m seriously in awe right now. All of my favorite science topics and then some… I absolutely can’t wait until September, but I digress. It’s only March. We’ve definitely got a ways to go yet. Here’s an example of what one of those assessment questions looks like in real life, just to give you an idea of what I mean. 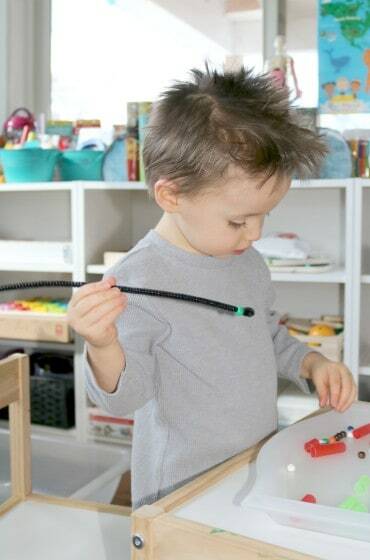 Assess: Did the child demonstrate fine motor control while threading the beads or straws? 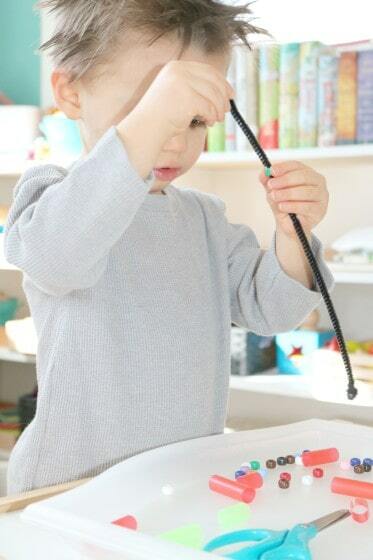 Yep, the little guy definitely has fine motor control while threading the beads or straws. He doesn’t have any trouble with either and both are relatively small. I’m sure you’re probably wondering exactly how knowing that helps me as a homeschool mama, right? 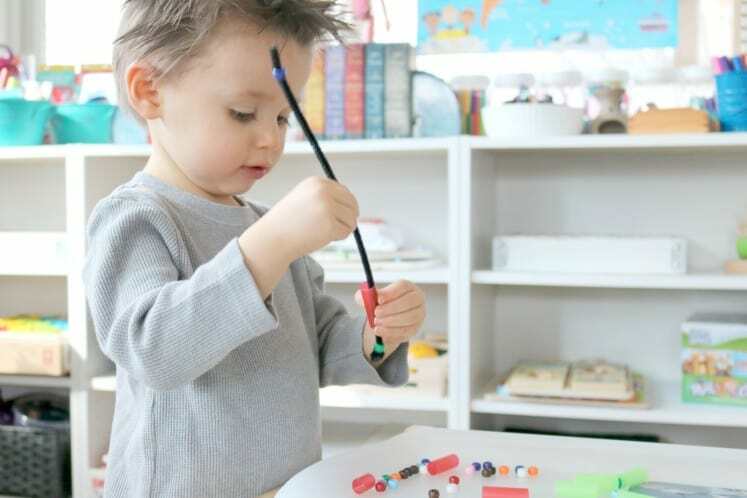 Basically, I can be sure that not only are the little guy’s fine motor skills right where they should be, but also that we can definitely still challenge him a bit more. One of the ways that I’m doing that is by adding tracing and mazes to our list of things to do. Like I said, all the awesome, new assessment tools we receive via Mother Goose Time are so helpful. And you can totally do your own thing and make it work for you.